Last week, I discussed with Peter Mello and Guy Mitrano on our Weekly Leader podcast #29 the importance of doing an end of the year review. As promised, here’s a process that you can use to evaluate the past year in your lives and work. Next week, we’ll take what we’ve discovered and plan for the 2010. The way we’ll do this is ask questions. A link to a simple question and answer page will be available at the end of the column. As you read through these questions, it will benefit you to download the three Circle of Impact Guides. 1. What changed this year? To answer this accurately, we may need to go back a year and a half to fully see the degree of change that has come to our lives and work. So, ask it this way, Over the past 18 months, what has changed in my life and work? Be as general or specific as you want. The purpose is gain perspective and understanding of what has been happening in your life and work. The focus of these questions is change, but defined as impact. Impact is change that makes a difference. We are looking to understand the impact of the past year, not simply what has changed. We ask the following questions to discover what we need to see. 2. What has been my impact over the past year? We break this question down into three questions that are the core dimensions of the Circle of Impact. Let’s ask this question in the foll owing way. What has been the impact of my Ideas over the past year? Ideas are anything we think or say that helps us understand, guide, focus or articulated our perspective or purpose. It is what we communicate, what we believe and what we use to make sense of our world. What has been the impact of my Relationships over the past year? It is helpful to make a list of all the people with whom you have regular involvement, from family, to co-workers, to colleagues and customers. Ask this question in terms of the difference you made in their lives and work, and in reverse, the difference that they have made in yours. In putting your list together, we are creating a map of the relationships that we’ll look at later when we plan for next year. What has been the impact of the social and organizational contexts where I am involved, over the past year? 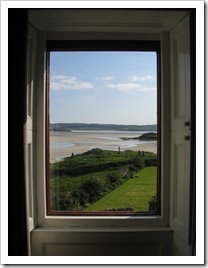 Simply make a list of all the places where you are involved, whether it is personal or professional, social or work. What difference have you made in each? Focus on the level of participation and responsibility you have and what your contributions have been. By identifying the difference you’ve made, you are seeing your value to each of these social and organizational contexts. 3. Who have I impacted over the past year? We’ve ask this question before, but in a more general way. This question is specifically focused on the people whose lives and work are better because of you. If your list is long (Way to go! ), then categorize the list according to the kind of difference you’ve made. The more specific you are the better able you are to understand what your strengths are. If you are having a difficult time putting a list together, then this provides insight into the meaning of your relationship with people. There is no defined list of differences that is universal for everyone. If there were, we’d end up missing or ignoring ones that are particularly our way of making a difference. You create your own list of the ways you make a difference. We’ll build on this in the next step. It is not unusual for people to find that their relationships are not very fulfilling. There can be many reasons for this. Usually the answer is not in the relationship itself, but rather what we bring to the relationship. Relationships are connections that we have with people. They need to have a common bond of meaning for them to grow beyond a superficial level. If we are unsure about our personal beliefs, then we may well be unsure in our connecting with people in a meaningful way. My seeing this, we know one area of our lives that we can work on for the next year. 4. What opportunities have I had this year? An opportunity is a product of how we think, with whom we are in relationship, and being in the right social or organizational setting at the right time. Opportunistic thinking is where we are aware of situations where we can make a difference. As a result, we take initiative to take some responsibility for the outcome of an event or project. The action of participating and making a contribution begins in our perception of what we bring to these social and organizational contexts. The more we take initiative, the more we see the opportunities that other people are not seeing. Opportunities also come through our relationships with people. The old adage, “Its not what you know, but who you know.” is true. Through our relationships with people we find out about the opportunities that are not directly in front of us. Think about the people whom you’ve met this year and what you’ve been able to do through them. Developing your network of relationships is key to being a person who makes a difference in the lives and work of others. Opportunities also come from being in the right place at the right time. Have you joined any new groups this year? What opportunities to make a difference are now available to you because of your participation? Also, what opportunities are not available to you because of the social and organizational situations you are in? Make a list of your places where you are involved either social or for work and evaluate whether you are free to have the impact that you desire. If you are not, consider how you can change your relationship to the organization or group, or whether you should continue your involvement. Last question is the hardest because it requires the most honesty. 5. What problems have I create during the past year that I need to resolved to be able to make a difference in 2010? These problems are ones that we have control over. You can blame the recession. You can blame whomever you want, but it won’t change anything. Focus, instead on what issues you do have control over. Typically, these are in categories of finance, knowledge and skills development, personal discipline and a too causal approach to performance in life and work. It also does you no good to elevate feelings of guilt and failure, even if they are justified. Instead, accept the situation as is, and resolve to take one issue at a time and work on it. Share this goal with a friend or spouse. Commit to gether to your success in resolving this issue. There will always be problems we must address. We are not seeking perfection, but progress forward that opens up to new opportunities to make a difference. Download the Circle of Impact Life / Work Planning Guide Part One: Review and print a copy of this column as your guide. Take some time during lunch to reflect on the past year and take some notes. Next Tuesday I’ll be back with part two and we’ll go to work to make 2010 a year of impact. Tagged with *, change. 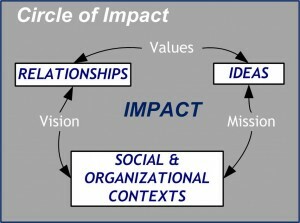 2009, Circle of Impact, contexts, difference, Guy, ideas, impact, life, Mello, Mitrano, opportunities, organizational, Peter, podcast, problems, questions, relationships, review, social, work.